Free Marketing Return on Investment Calculator. It’s more important than ever to understand how your marketing budget is being spent and what return it is providing for your business. 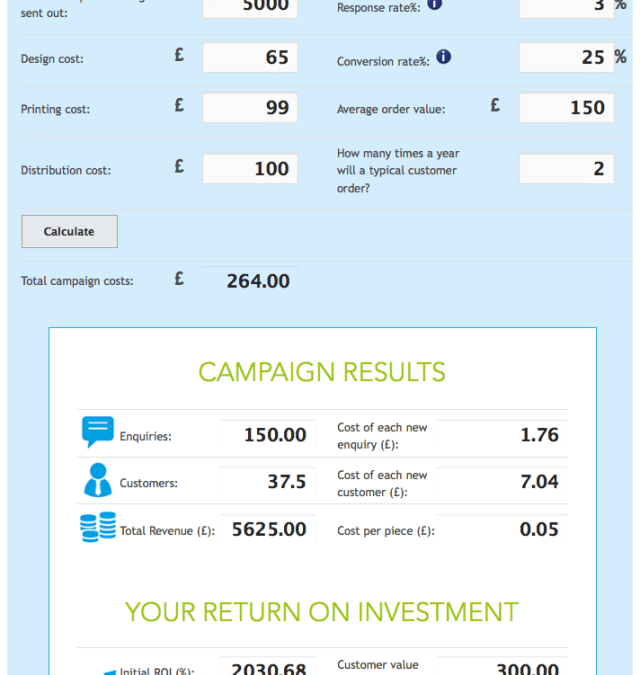 So to help you with this, our colleagues at printing.com have devised this really simple but clever Marketing Return on Investment Calculator. Follow this link to access the online calculator. Enter your costs and projected results to easily calculate the ROI and other relevant details like cost per piece, cost per enquiry and cost per customer. You can even use the tool to test different sets of assumptions to see how response rates and conversions may vary. We hope you find it useful. Should you need advice on any forthcoming promotions then please give us a call on 01543 261220. We would love to help!